Glue pot has an automatic thermostat control that will hold glue temperatures within 1 degree so that glue will not be overheated. 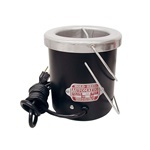 The pot is double insulated enabling the heat to stay on the inside, thus saving on energy costs. The quart size, removable container is made from heavy spun aluminum that has a turnover flange to prevent glue from lodging in the inner chamber.